"Morel is the foundation of the New York City Ortho-Bionomy® community. She has consistently been generous with us with her time, energy, and expertise since she first came to teach a class in 1995. Her clarity and attention to detail in this work is unparalleled. We think that her influence is what has helped us to create our “NYC style”. We have grown together over the decades in a synergistic relationship for everyone’s benefit. Morel holds a high standard, has been willing to up her game, been supportive of our individual explorations, which in turn has motivated us to be our best." Whether by fate, mission, or design, Morel Stackhouse is the catalyst, the Mother if you will, of the New York Ortho-Bionomy Community. She was the first Instructor to realize its untapped potential, nurture it, bind it together and bring the right resources and people to it. She kept coming to us sharing her knowledge, wisdom, and example, long before we realized we were a community and long before it was profitable to do so. She has been Teacher, Mentor, Advisor, Cheerleader, and Friend to us all and my life has been enriched in more ways than I can measure because of having taken my first Ortho-Bionomy class with her and having her as a role model as Practitioner and Instructor of Ortho- Bionomy. Advanced Phase Four Spine & Pelvis is a continuation of Phase Four Ortho‐Bionomy Fundamentals: Spine & Pelvis. In this class you will observe and practice specific techniques for releasing imbalances of the pubic bone, coccyx, hemi pelvis, femoral/coxal joint, facet joints, and muscles of the back and pelvis. You will also learn techniques for working with the spines of people with scoliosis and people who have undergone spinal fusions. These techniques result in the release of pain and neuromuscular tension patterns and promote an expanded range of motion, increased circulation and a greater sense of well being. Free Ortho-Bionomy® introductory lecture and demonstration with Morel. Ortho-Bionomy is a gentle, osteopathically-based form of body therapy, highly effective for chronic stress, injuries, pain, or problems associated with postural and structural imbalances. The practitioner uses gentle movements and positions of the body to facilitate the change of stress and pain patterns. Strong focus is placed on the comfort of the individual and no forceful manipulations are used. Ortho-Bionomy helps to alleviate both acute and chronic pain and stress patterns by reducing chronic muscle tension, soothing the joints, increasing flexibility, improving circulation, and relaxing the entire body. Ortho-Bionomy techniques are highly effective, easy to learn, easy on your body, and combine well with other bodywork and complimentary healing systems. Ortho-Bionomy Fundamentals: Extremities covers the history, philosophy and basic concepts of Ortho-Bionomy. In this class you will observe and practice specific techniques for releasing imbalances of the shoulder girdle, arm, elbow, wrist and hand; hip, leg, knee, ankle and foot. These techniques result in the release of pain and neuromuscular tension patterns, promoting expanded range of motion, increased circulation and a greater sense of well-being. This class presents the Chapman's Reflexes system of identifying and stimulating reflex points to facilitate lymphatic drainage and balancing of the organs. The class also looks at relationships between the reflexes, endocrine system, and structural balance. Innovations in Chapman's Reflexes developed by the NYC Ortho-Bionomy® Lab group will be shared. Ortho-Bionomy: Exploration of Movement Patterns adds depth and dimension to Phase Four Ortho-Bionomy, moving it from technique to art. In this class you will learn to observe and explore various patterns of movement throughout the body in skin, fascia, muscle, connective tissue, bone, nerves, and fluid. We will use movement as both a means of assessment and as a release technique. Bodies are designed to move - releasing them through the application of movement deepens the connection between form and function, integrates the releases with the rest of the system, and gives the body a deeply-felt experience of itself. These techniques form an excellent bridge from the physical to the energetic work of Ortho-Bionomy. This course covers the history, philosophy and basic concepts of Ortho-Bionomy. In this class you will observe and practice specific techniques for releasing imbalances in the neck, thoracic spine and ribcage, lumbar spine, pelvic girdle and sacrum. These techniques result in the release of pain and neuromuscular tension patterns, promoting expanded range of motion, increased circulation and a greater sense of well-being. This class looks at the Biological Model of Trauma, how trauma affects people, and how practitioners of therapeutic bodywork can most effectively work with individuals who are affected by trauma in ways that support their healing process. Participants will learn about the neurological basis of trauma in the autonomic nervous system and how to recognize signs of trauma in their clients. We will explore Trauma Resourcing in depth: specific verbal and energetic approaches as well as bodywork techniques for working with trauma-based dysfunction in the body. We will learn to work with various types of scar tissue, adhesions, broken bones, implanted hardware and prosthesis. Ways to support clients before, during and after surgery will be discussed. In this class you will explore the lower extremities in detail. Releases will be shown for the soft tissue structures as well as joints. Ortho-Bionomy® Fundamentals for the Extremities covers the history, philosophy and basic concepts of Ortho-Bionomy. In this class you will observe and practice specific techniques for releasing imbalances of the shoulder girdle, arm, elbow, wrist and hand; hip, leg, knee, ankle and foot. This class presents the Chapman's Reflexes system of identifying and stimulating reflex points to facilitate lymphatic drainage and the balancing of the organs. 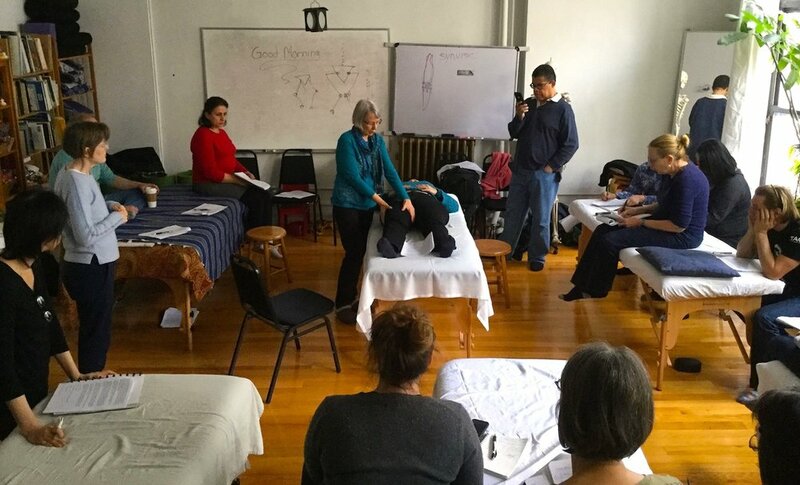 The class also focuses on the relationship between the neurolymphatic reflexes and the endocrine system and its affect on structural balance as well as the individual's physical and emotional well-being. Morel will share innovations in Chapman's Reflexes developed by the NYC Ortho-Bionomy® Lab group. “I throughly enjoyed learning this information. I will use it in my practice immediately." Ortho-Bionomy® Fundamentals for the Spine & Pelvis covers the history, philosophy and basic concepts of Ortho-Bionomy. In this class you will observe and practice specific techniques for releasing imbalances in the neck, thoracic spine and ribcage, lumbar spine, pelvic girdle and sacrum. In this class, you will learn ways to assist your clients who are having, or who have had knee replacement surgery. Topics will include an overview of the knee replacement surgical process, preoperative care, i.e., the important areas to work with the day/night prior to surgery, postoperative care, i.e., the day of surgery and beyond, and complimentary medicine for healing. This class will also include how to work with common postoperative issues such as difficulty with knee flexion and extension, fear/trauma, incision care, swelling, and pain. Spines with scoliosis are challenging to work with and conventional Ortho-Bionomy approaches are often unsuccessful. We will explore specific ways to adapt our table work approach to the client with scoliosis. We will review self care exercises developed by Arthur L. Pauls, and discuss postural re-education as it applies to these clients. Techniques and exercises for promoting balanced posture within your own body, as well as for working with clients. Techniques to work with spinal curvatures and scoliosis. Post-techniques for the pelvis, spine and ribcage. Post Techniques exercise the spine and the intervertebral disks. They can be used for both assessment and release, as well as integration of the work done in a session. Copyright © Morel Stackhouse 2018 onward. Society of Ortho-Bionomy International® is a registered trademark that indicates membership in the Society, and it is used with permission. This site is maintained ♥ with love.